So a bit of relationship lore: Brian proposed to me after a nice walk around Lake of the Isles, here in Minneapolis. (It was also April Fool's Day, but that's a whole other story). In a nice piece of absurdist theater, at the key moment I was so involved in an internal dialogue trying to figure out how to ask Brian about getting married that I actually didn't notice at first that he was going down on one knee and pulling out a ring. Classic. It's uncanny the way that history repeats itself. One of the big to-do's today was heading to the bank to close out our safe deposit box and collect the documents and valuables we'd stored there. 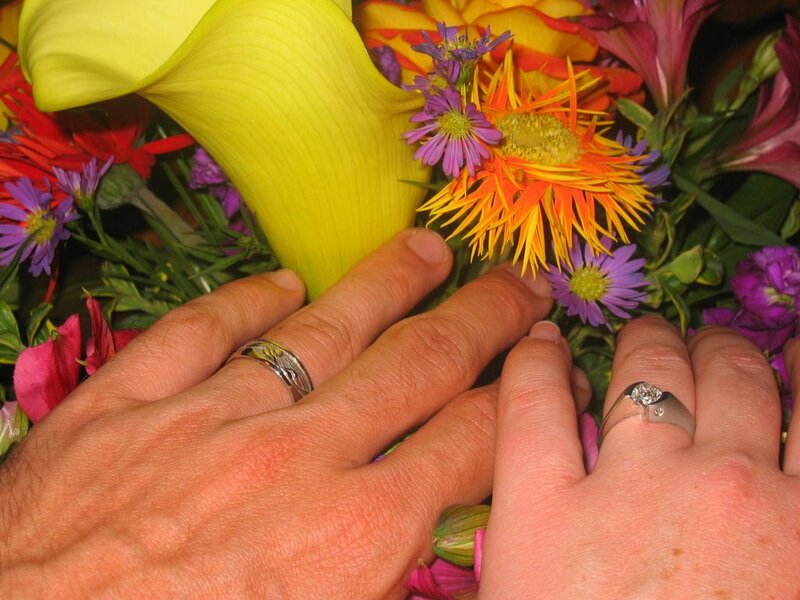 Included in the haul were our wedding rings, which we had not wanted to risk wearing on the trip. As soon as I saw them I was immediately full of plans: the 21st is the six year anniversary of our starting to date and I had visions of taking Brian out to our favorite neighborhood Italian place (Broders Pasta Bar....if you're ever in town we HIGHLY recommend it) to celebrate. Just as I was imagining us slipping the rings on each other's finger over a nice bottle of wine, I looked down to notice that Brian was again on bended knee, opening the ring box and asking me to marry him all over again. (all together now: awwwwwwww). Actually, an interesting coda to the story was our discovering our unexpected attachment to our replacement/travel rings. It probably shouldn't have been surprising: we've actually worn the travel rings for more of our married lives, they came from our second home (Denmark), they're matching (unlike our 'real' rings), and they have shared adventures with us all over the world. After all that, we didn't want to say goodbye; we now are proudly wearing them on our right hands as a continual reminder of all we've shared and experienced over the last 15 months. And we're cool with that. More from the frozen tundra as it occurs. No, the house isn't sold yet. It's baby steps here at the blog, baby steps.